Non-hybrid 2019 Toyota RAV4s on sale in U.S. in December. CARMEL, CA – It’s been nearly a year since the RAV4 overtook the Camry as Toyota’s top-selling vehicle in the U.S. The boost in production volumes that came along with the fourth-generation model and the rising popularity of C-segment CUVs made it possible for Toyota to sell 407,594 copies of its current-gen RAV4 in the U.S. last year. The RAV4 is the top-selling model not only in Wards’ Midsize CUV segment (usurping longtime rival the Honda CR-V last year) but also now is the best-selling non-pickup light-vehicle in the U.S.
With 353,151 deliveries, the CUV placed fourth behind the No.1 Ford F-150 (695,425), No.2 Chevy Silverado (470,996) and No.3 Ram (411,753) through October of this year, Wards Intelligence sales data shows. After a test drive here, we come away thinking the new fifth-generation RAV4 going on sale in the U.S. next month is a risk. Toyota has given it the look and feel of a brawny off-road SUV (it’s a CUV, riding on a unibody platform) rather than the sleek, smallish car-based crossover packaging that made the current-gen RAV such a success. Making the vehicle more rugged likely has to do with the arrival of another Toyota midsize CUV to satisfy robust demand in the U.S. Wards Intelligence forecasts in 2022 Toyota will begin producing a new midsize CUV off the Mazda CX-7 platform at Toyota and Mazda’s new joint assembly plant in Alabama. To avoid competing with what probably will be a more sinewy, car-like CUV, Toyota has pushed its long-time midsize CUV in this brawnier direction. The new RAV looks big and drives big, despite minor dimensional changes. The non-hybrid grades feel heavy, have a harsher ride and are sluggish to accelerate, hampered by a weak tip-in and a high torque peak (5,000 rpm) from Toyota’s 2.5L Dynamic Force DOHC 4-cyl., which like the same engine in the new Corolla hatchback is using the automaker’s D-4S direct and port fuel injection. Our testers, particularly the non-hybrids, are loud inside due to excessive engine- and wind-noise intrusion into the cabin. The small, low-resolution screens for the infotainment displays in both hybrids and non-hybrids are disappointing – fuzzy, dull and appearing aged compared to those in the redesigned Avalon and Camry sedans. But the new RAV4’s best attribute might be its optional hybrid powertrain. In late 2015, we averaged a fantastic 44.5 mpg (5.3 L/100 km) in the current-generation RAV4 Hybrid. The new model obliterated that, its Limited grade tallying 50.2 mpg (4.7 L/100 km) on one route up and down Pacific Coast Highway here. A second journey in a hybrid, this time the XSE, returns 43.6 mpg (5.4 L/100 km). What’s more remarkable is that the route we travel with the Limited grade has little of the braking or low-speed driving usually necessary to return higher-than-EPA-estimated fuel economy in hybrids. The beauty of Toyota’s hybrid system is its ability to frequently slip into and out of EV mode during steady travel at speeds above 20 mph (32 km/h), something we observe via the energy flow display. Below 20 mph typically is the only time you’ll be able to stay consistently on battery power, which is in keeping with other Toyota hybrids. As in the outgoing RAV hybrid, Toyota pairs a gasoline engine (a 176-hp version of the 2.5L Dynamic Force using Atkinson cycle) to three motor-generators, an electronically controlled CVT and a nickel-metal hydride battery pack. The two front motor-generators (one to recharge the battery pack, the other to drive the front wheels) are mounted coaxially to reduce friction and improve packaging. For the e-CVT, a nearly 25% reduction in transmission losses is achieved by using a parallel shaft rather than planetary reduction gear while the parking gear, counter-drive gear and power-split planetary ring gear are integrated into a new multifunction gear. The NiMH battery pack is 11% lighter and now small enough to fit under the rear seats rather than the cargo area (although there is a small shelf at the far back), growing the latter space by 2 cu.-ft. (57 L) from the outgoing model, Toyota says. 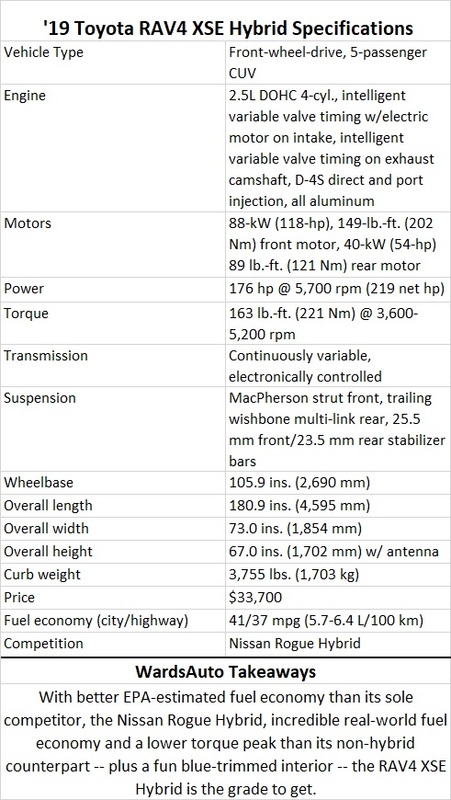 The hybrid and lower-grade FWD models are roughly 100-200 lbs. (45-91 kg) lighter, thanks in part to Toyota’s new TNGA platform and more lightweight high-strength steel in the RAV4’s upper body. The hybrid is much more responsive than the standard RAV4 when we hammer the accelerator, not surprising due to its 118-hp (80-kW) second motor-generator driving the front wheels and making 149 lb.-ft. (202 Nm) of torque from 0 rpm. Toyota says MG2 was made smaller and spins at a higher rpm vs. the outgoing RAV4 Hybrid’s MG2. The 2.5L’s peak torque also arrives sooner than in the non-hybrid – 3,600 rpm – due to unique calibration. Th e rear motor-generator, with more aggressive gearing for ’19 and able to drive the rear wheels, powers the RAV4 Hybrid’s standard all-wheel-drive system. Available is a new Trail Mode, which uses brake control to help direct power to the tires with the most traction. “So it’s very similar to an auto (limited-slip-differential) functionality on gas models (and) drive-force distribution can also be changed, and on hybrid models we can actually send up to 80% of drive force to the rear axle. That’s up 20% from current gen,” Toyota U.S. marketer Jeff Halsey says. Adventure and Limited AWD models have torque vectoring AWD, a first for Toyota in North America, and can send up to 50% of engine power to rear wheels. A coupler on the front of the driveshaft allows disconnecting the rear driveline for improved efficiency. A twin coupler system in the rear allows independent power control to the left rear and right rear wheels. Power output can be varied to keep the RAV4 on the driver’s intended path in both cornering and straight-line, steady-state driving, Toyota says. Tested here on a short off-road course, both the Adventure and XSE Hybrid models climb a steep hill with deep ruts without getting stuck. 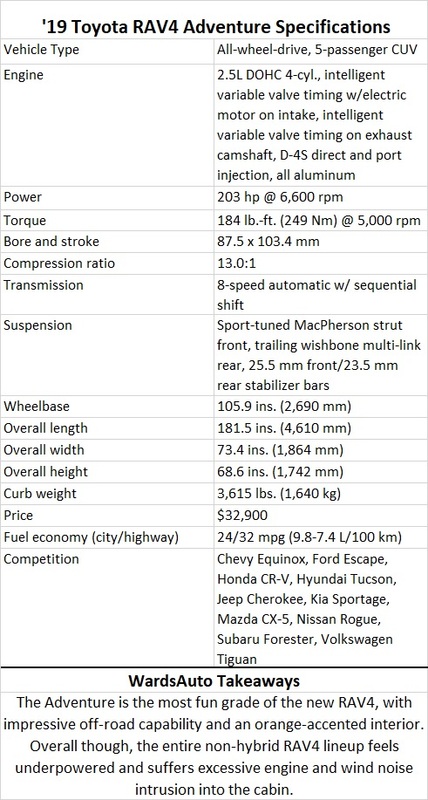 We question how many people will off-road in a unibody CUV regardless of its AWD capability. Still, it’s a nice compromise between generally less fuel-efficient body-on-frame utility vehicles and oftentimes wimpy car-based crossovers. While the displays underwhelm, the RAV4’s overall interior is excellent, easily one of Toyota’s best due to its attention to detail and fun colors and shapes. Adventure-grade models feature orange accents, while XSE hybrids get blue highlights. In the Adventure, bins and the bottom of cupholders are textured with diamond designs and rock-like perforation patterns are used on its seats (see photo above, left). 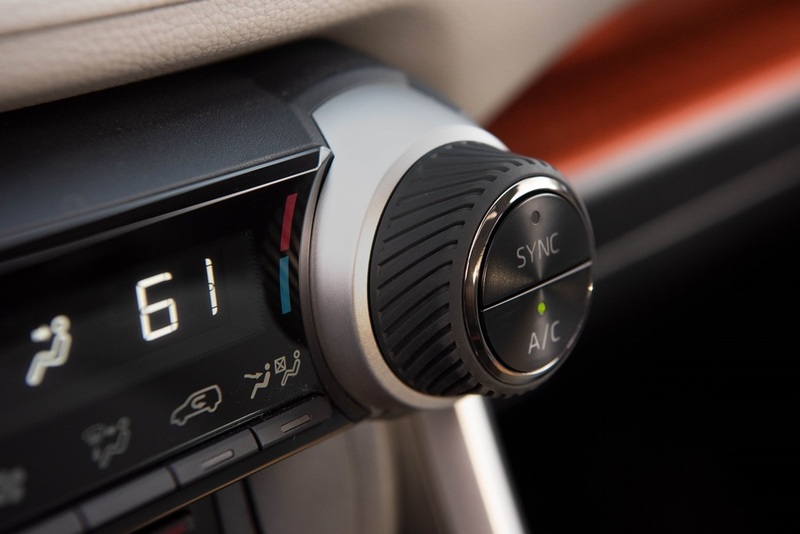 Center stack knobs for audio and HVAC systems are ringed in rubberized material for better grip (see photo below, left). 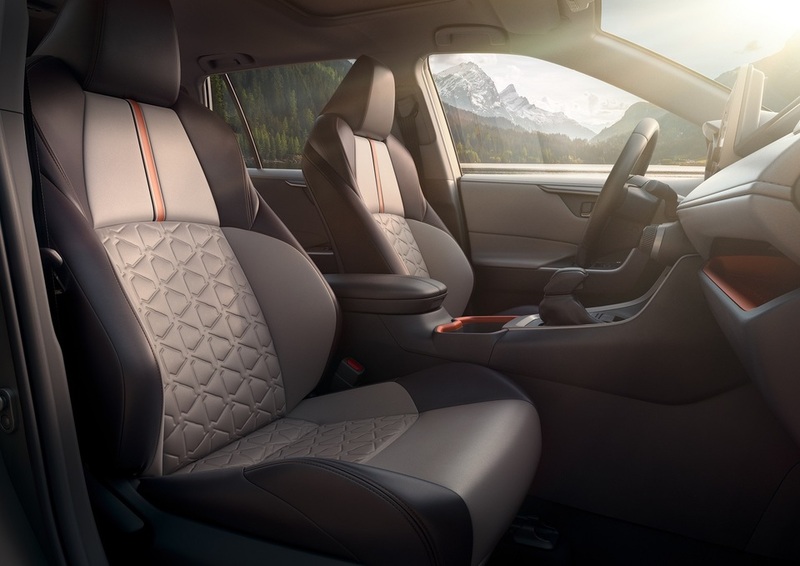 The outgoing RAV4 Hybrid suffered from poor interior ergonomics and too many hard-plastic surfaces, but the new model delivers generous amounts of soft-touch material. Fit and finish in the pre-production models here is perfect. Grab bars have no exposed pins (although a seam where front and back pieces meet is felt), door pockets are free of flashing and stitching and panel gaps are even. Toyota, a longtime holdout on the feature, offers Apple CarPlay in the new RAV, as well as Amazon Alexa compatibility and Verizon Wi-Fi. Its exterior styling is attractive, despite some grades getting Pontiac-like wheel-well cladding. Major changes are a higher hood and a D-pillar that is more forward raked. Overall, the vehicle is chunkier than the model it replaces. Non-hybrid grades of the new ’19 Toyota RAV4 go on sale next month in the U.S., ranging from $25,500 to $33,500 for front-wheel-drive grades and $26,900 to $34,900 for AWD grades. The hybrid hits Toyota dealers in March, starting at $27,700 and topping out at $35,700. All grades increase in price from ’18, but Toyota argues more standard content has been added for ’19. Destination and handling of $1,045 is not included in the above prices. As much as we enjoy the Adventure’s funky interior and off-road ability, the sporty XSE Hybrid is the star of the lineup. It’s likely with this model, and three other hybrid grades, Toyota will get its wish to raise the RAV4 hybrid’s mix to 25% of sales vs. the 12% share hybrids held in 2017. Hybrid RAVs are just $800 more to start than non-hybrid AWD models. With its stellar fuel economy, plus a more forgiving ride, it’s hard to imagine why anyone wouldn’t opt for this variant. Spread across years of loan payments, $800 is nothing.